In this guide, learn about the various ways employee hours are maintained and measured -- as well as how to review and make corrections. ACAManager is maintained by loading hours on a Daily or Monthly basis. Uploading employee hours on a recurring monthly frequency -- at minimum -- ensures accuracy in assessing the employers cost vs. potential penalty; and allows employers to identify benefit eligible opportunities. This gives the employer the ability to be proactive in addressing the needs of their employees while minimizing risks. 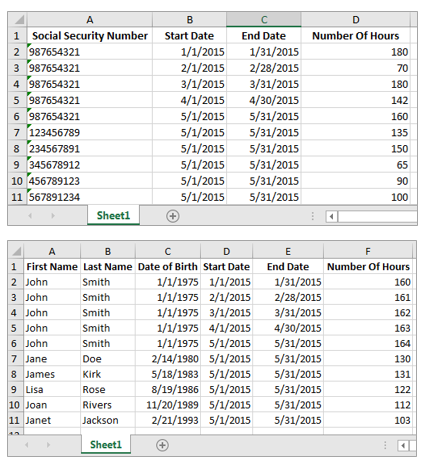 In preparation for loading employee hours, it is recommended that a template spreadsheet capturing employee hours be prepared using the Sample Template, illustrated in the figure below. This spreadsheet should include the hours worked on a monthly basis for each of the employees who reported hours of service during the measurement period. 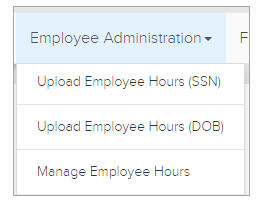 Once your spreadsheet has been prepared, you will select Employee Administration from the drop down menu and click Upload Employee Hours (SSN or DOB). Select your file by clicking on Browse. 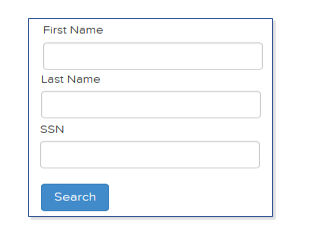 Once you have located your file, double click on it, this will attach your file to the application. If the system cannot accept an employee record due to missing or incorrect information. The list of the rejected records will be displayed on the Employee Hour Errors page. Employee Hour Errors gives you the ability to manage and correct hour errors generated from the document upload instead of the whole file being rejected. 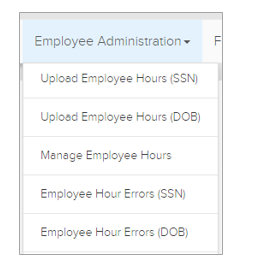 From the Employee Administration, select Employee Hour Errors (SSN or DOB). Employee Hour Errors will provide you with a list of errors and the reason for the hours not being saved. Errors can be resolved by reimporting the hours or clicking the “Edit” button to view details and make any necessary changes. If changes are made, select Save before continuing. In order to delete errors in mass you can click Select All check box and then click Delete. Individual errors can be deleted by selecting the Delete next to the corresponding line item. 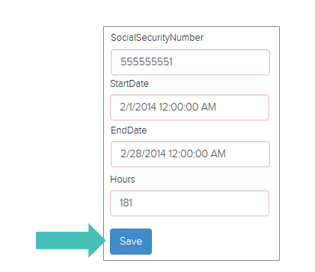 The system secures historical Employee Hour Errors so that you may view and track the hours captured. 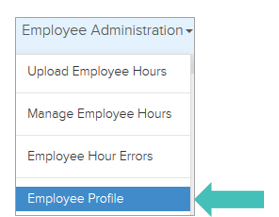 Once you have entered criteria select Search, click Select associated to the respective employee in order to view the hours associated with that employee.